For some reason…. Im expecting a waxed twinkle-shine on his face. well, at least he won’t get razor burn. 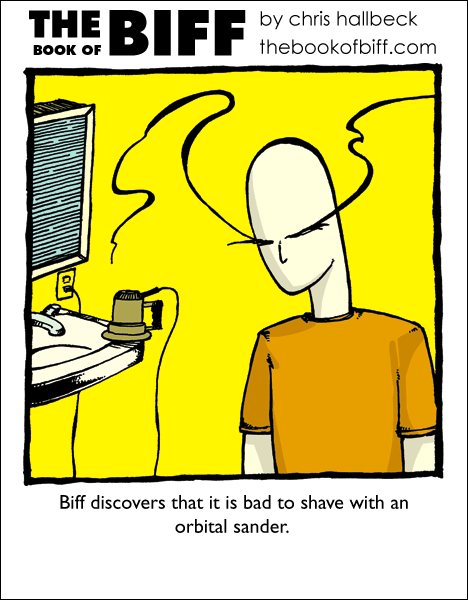 Had I not already seen the “too short haircut at the barber shop” cartoon, I would have posted my “real men use circular saws for shaving” joke here. Alas, I have been preempted. So that really is a mustache. I knew it. It’s a dual function mouth/mustache. So he shaved off his mouth? Yes. It took me a while to notice it was gone, though…lol. My god. How does he think that is a good Idea? I laughed SO HARD when I read the comments and I thought about how he may have shaved his mouth off. I was drinking soda from a cup through a coffee-stirrer sized plastic straw at the time (don’t ask me why). Chris, you are so darn lucky that I did not swallow that straw, or you would have been in court, and I would be accusing you of attempted murder. I kid, I kid, but seriously, that is the funniest thing I have ever seen in a webcomic. At leas it isn’t a cheese grater. We all really have to stop drinking when we’re reading this. I think I need a new keyboard…. I always keep a backup keyboard at hand when reading this comic. His eyebrows are obviously horrified. o.O…it’s a good thing he never talks in these comics. I agree. Waterproof keyboards for everyone! Or you could just stop drinking, but isn’t that a bit complicated? What about those new optical keyboards, you know, the ones where there’s a little thing that beams light that creates a keyboard on your desk, and then reads the places you put your fingers by reflected lights? Were does he buy all this stuff? He must have alot of money for all this random stuff be buys. Those Silicone-Rubber Things are totaly bull, as are the Projectorinputs. They will see their use, but they won’t find Application in the broad Mass. At least he still has his eyebrows.